AllWinner has released some more materials about their AllWinner A80 Ultracore octa core big.LITTLE SoC ahead of the Hong Kong Electronics Fair 2014, and we’ve learned more about OptimusBoard, as well as tablets and TV boxes availability through a video interview shot by Charbax at the exhibition. The company expects AllWinner A80 to be used in tablets, android boxes, notebooks, Smart TVs, All-in-One PCs, and digital signage players. That’s probably they’ve done some work to officially support 5 operating systems: Android, Chrome OS (work in progress), Ubuntu, Firefox OS, and Windows RT (commercial negotiations and work in progress). 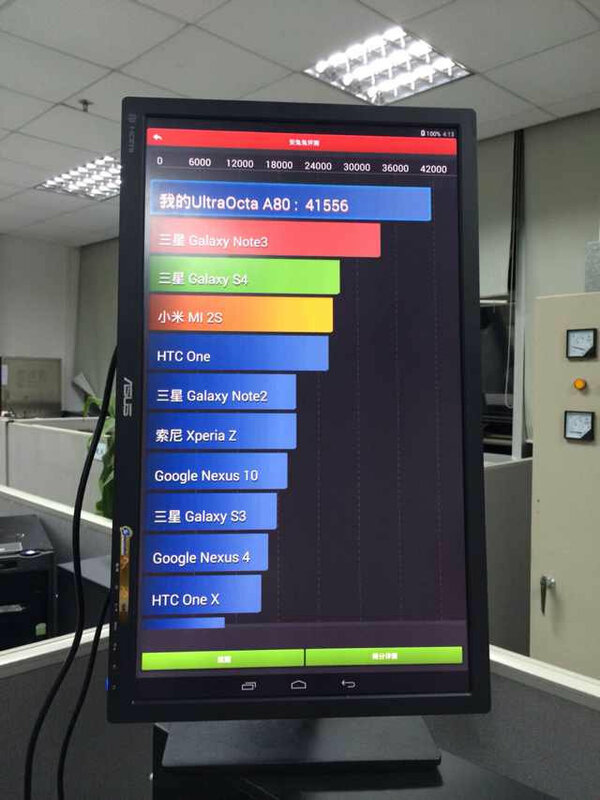 AllWinner UltraOcta A80 is said to achieve 41556 in Antutu showing it easily outperform Exynos 5420 Octa core processor found in Galaxy Note 3, but this result has been achieved with a development board featuring heatsink and fan, so it’s unlikely you’ll get such score in your AllWinner A80 based tablet and TV box. In the video below, you see some demos with real-time 4K video decoding/encoding with a 16MP pixel and 4K TV, HEVC video playback, 3D face rendering to show off GC6230 GPU performance, and a network video recording demo that can be used in automotive applications. You’ll also a reference tablet, and some charts showing the performance / power consumption ratio. There are some good news about the OptimusBoard as it should be available in May for less than $100 via Cubieboard and/or PcDuino teams. Android tablets will be available by the end of May, and TV boxes a little latter. Hi, but lack native sata support ? Supports 3840×[email protected] 3D encoding, in HEVC or H.264 only?? I don’t think the allwinner a80 device will come to market so early. As far as i know, there is a long way before it can real use in tablet and tv boxes. as there’s only hdmi 1.4 support, anything over 1080p is wasted. nobody support anymore high speed buses like sata or pci-e on these kind of devices, probably for cost reasons. the last one I’ve seen was A20. Both the Tegra 3 and Tegra K1 have PCIe, don’t know if Tegra 4 does. Also the Freescale i.MX6 has PCIe too. Forgot to mention the Freescale i.MX6 also has SATA. Ubuntu support is nice but I wonder if they mean Ubuntu touch which is more Android with some Ubuntu stuff on top or the real desktop version of Ubuntu. I’m still anxiously waiting for the A80 board which I’m planning on getting. Then again I might go for an A80 TV box instead as that will include a box and all the nice things. Tegra K1 might have PCIe and stuff but the dev board is $200 and Freescale i.MX6 is just not powerful enough. Ubuntu Touch is Ubuntu. They are one in the same. They run the same apps, etc. “Ubuntu “Touch” was never the official name, and was only used the refer to the mobile touch interface in development. Once the mobile touch support is fully integrated and it ships on devices, it will just be called Ubuntu, and will run the same code as the desktop. Also, Ubuntu is not “Android” with Ubuntu stuff on top… Not even remotely close… I don’t know where you got that from. Perhaps you are referring to the beginning days of the “boot up” hacking/porting process.?? In any regard, Ubuntu is a fully featured Linux running native apps. Android is linux “based” (ie: A forked linux kernel) with a customised/slimmed down version of Java Virtual Machine running on top.